Hi there, everyone! 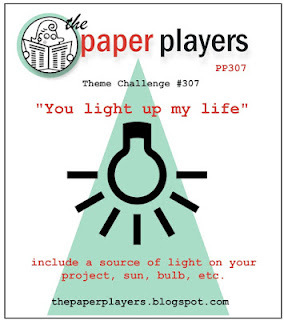 This week at The Paper Players, Joanne is our fabulous hostess and she has a theme challenge for us: to include a light source on our project. It sounded challenging at first, but I didn't have to think too long before I came up with an idea. I hope a few of you will recognize the scene I tried to create here as a scene from the beloved children's book by C.S. Lewis, The Lion, the Witch and the Wardrobe. I'm re-reading The Chronicles of Narnia for the first time since my childhood and truly enjoying every page. They are not just for children! As the author said in his dedication: "Some day you will be old enough to begin reading fairy tales again". When Lucy first comes through the magic wardrobe, she find a lone lamp post in the snowy wood. Here she meets Mr. Tumnus the Faun who invites her for tea and cakes, and this is the beginning of her adventure. It took me a few tries before I got the scene as I wanted it, mostly due to the masking and sponging. The final layer is some snowflakes created with modeling paste through a stencil. I really enjoyed my time spent making this card while daydreaming of Narnia, so I thank you, Joanne! take us far from home. lead us to our destiny. This card will go to my son who is also a big fan of C.S. Lewis. I added one of the author's quotes as my inside sentiment which I think my son will appreciate as he's all about adventure. I forgot to take a picture of it before I sealed it and mailed it off, but there it is! I hope you enjoyed my creation! If so, I would be ever so pleased if you left a comment. Then please visit the rest of our fabulous team at The Paper Players! I love everything about this! So calm and lovely with the single lamp glowing in the snow! Beautifully done....worth all that sponging and masking! And the snow will be flying here before we know it! So clever Sandy, to use CS Lewis for inspiration!What a lovely winter scene. Enjoy reading your novels again...sounds fun! Oh my, what a perfectly beautiful little scene. I haven't read the Narnia books for a long time either...you've inspired me to look for them on my bookshelf! (I read all of the Anne of Green Gables books a couple summers ago!!! First time!) A perfectly serene scene! WOW, everything about this card is just perfect. I have nothing else to say, LOL. The minute I saw your card Sandy I thought how it reminded me of that scene through the wardrobe in Narnia - so to read that it was your inspiration must mean you are right on the money with this one! I just love your Christmas card, executed so perfectly - I just love the texture of the snow! Such a beautiful card - great job!